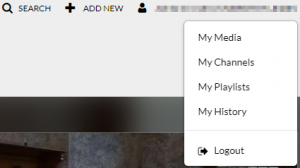 Click on the user-menu to expand it. Choose a video to add captions to and wait for it to load. 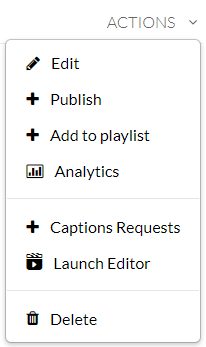 Choose ‘Captions Requests’ from the actions menu (on the right hand side below the video). A new section will appear! Choose the appropriate spoken language in the language selector. Currently Dutch and English are available. | NB: Not selecting the spoken language will make it impossible for the system to create correct captions! After you have chosen the appropriate spoken language in the selector please press ‘Submit’ to add your request to the queue. A new section will appear which shows the request is pending and the blue bar below tells you the captions will automatically be uploaded to your video upon completion. This screen will not automatically refresh when the status updates to “Completed”! Processing time is approximately 30 minutes for short video’s up to 15 minutes and about twice the length of a video when longer than 15 minutes. We recommend you close this screen during the processing time! When processing finishes the status will change to “completed” and a pen icon will appear to the right of the status which allows you to edit the captions. You can now choose to review the video by pressing play after refreshing the page (don’t forget to press the ‘Closed Caption’ Button (CC) on the bottom right of the video!) or to start editing the captions by pressing the pen icon.